We were walking around the lot the other day and I saw an opportunity to share a couple shots with you. Its a great time to Buy a Nissan! Yes it is always a good day to buy a Nissan here at Bertera Nissan. Adding to that the end of the month is upon us it makes it an even better time to buy a Nissan! Just giving you more reasons to Choose Bertera Nissan when you Choose Nissan! How would it feel if you won a $100 Gift Certificate and a Hulu PLUS (6months) subscription for FREE? Or, how about a 3 Month FREE Hulu PLUS subscription, or even a one month FREE Hulu PLUS Subscription? We think that will feel pretty good, which is why we’re giving you a chance to win those great prizes! All we need is you and a Nissan in the photo – it doesn’t have to be a Nissan that you purchased at our dealership. Just make sure that your photo is submitted to us with your contact information. And, once we upload your picture, you can share it and ask for “Likes”. This is super important, because the winning Bertera fan photos (3) will be the Photos with the most “Likes”! We have 1st place , 2nd place , and 3rd place prizes, so your odds of winning are very good! 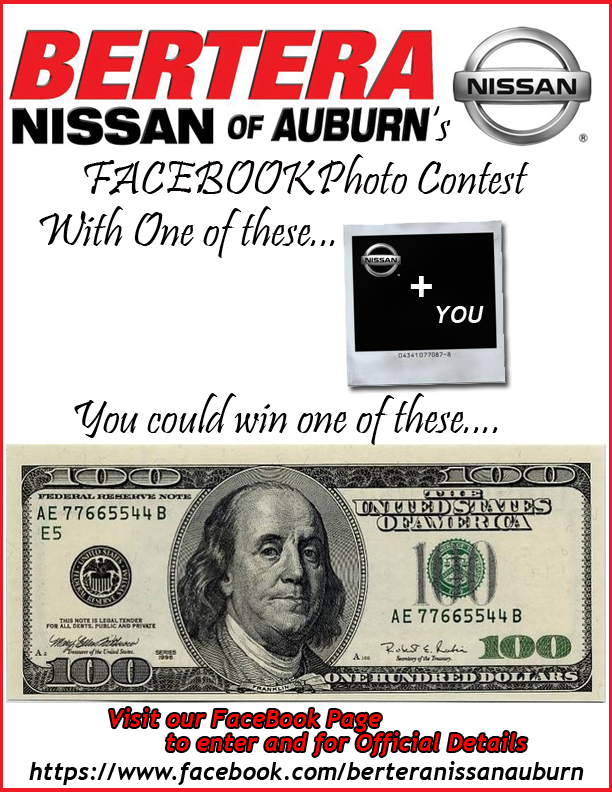 Click the photo below to be brought to the photo entry form on the Bertera Nissan Facebook Fan Page. All you have to do is like our page, upload your photo and submit your information to us (and you can do that several ways, check out our Facebook contest page for details). Once we add your Photo to the Photo Contest Album you can start sharing and asking for likes. For more information call us at 508-832-9611 or feel free to contact us through the message section on our Facebook page. Thanks for Reading and Keep Smiling!